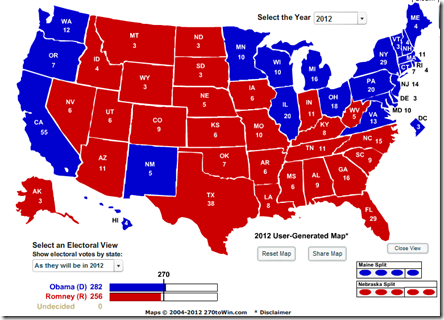 Obama vs Romney – Decide Who Wins! Click on each state in the map with your predictions, and the running total at the bottom will tell you who wins! You can also cycle through the results of elections 1789-2008, which is entertaining if you read the little election facts at the bottom of each map. Personally, it kind of reminded me of playing Risk on the computer back in college.